Principles of Railway Operations by John Glover is essential reading for the modeller of today’s railways and provides a first rate insight into the workings of the post privatisation railway network in Britain. Unless the modeller has a thorough understanding of the way the real railway is operated he cant hope to capture it convincingly in miniature. Following the privatisation of the railways, the nature of railway operation changed significantly. The delivery of a safe service to the present day customer has become much more complex. In place of the unified nationalised network, more than 100 different companies are now involved in the day-to-day running of the railway network. The companies involved vary in scale quite significantly; from Network Rail, the state-controlled single company that owns the whole operational infrastructure, through the three companies that provide the rolling stock and the some 25 Train Operating Companies through to the myriad companies involved in freight, maintenance and other operational aspects. 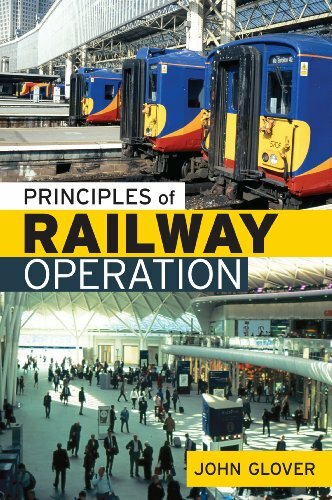 Principles of Railway Operations is a fully revised and enlarged version of ‘abc Railway Operations’ (originally published in 1999) in the format adopted for the later ‘Principles of London Underground Operations’ (published in 2000). Individual chapters deal with the organisation of the contemporary railway, the principles behind the safe operation of railways, track and signalling, passenger stations, passenger train operation, freight train operation, service provision and planning, safety and much else. There can be little doubt that the modern railway network – as bequeathed by the complex process of privatisation – is less straightforward than it was under British Rail; confusion abounds, both within the industry and amongst its customers (both passenger and freight), and objective information is all the more essential in these circumstances. The industry itself recognises that knowledge of the principles of railway operation is essential to the industry and this is reflected both in the increased impetus that the Chartered Institute of Logistics and Transport and the newly-established Institute of Railway Operation give to training.